That lovable, gleeful monster from Bunnies!!! (2015) is excited once again. Thank goodness, the bunnies and monster are still the best of friends. And Atteberry’s horned, blue, oblong protagonist still loves to greet everything with gusto: “Hello, sun. // Hello, clouds….” Uh-oh. Wait. Clouds? That could only mean one thing. “Rain! Rain! Rain!” As fat drops splatter from the sky, the monster happily prances around (the bunnies, not so much). 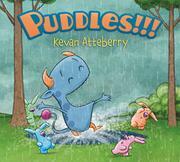 However, when the monster spots a certain byproduct of the rain, total, unbridled joy bursts forth: PUDDLES!!! Then, even better than puddles, there is MUD!!! The waterlogged bunnies, with soggy, drooping ears, have a decidedly different reaction. However, a bright bolt of lightning and scary boom of thunder unite the pals again. With four full double-page spreads dedicated to the storm, each one growing darker, with increasing terror creeping across the monster’s and bunnies’ faces, the story takes a turn from the carefree puddle-jumping cover. Luckily, a dazzling sight at the end ensures all concludes on a happy note.